Akai Professional worked in partnership with software developer Ableton to create the APC20, the second control surface created by Akai Professional for performance with Ableton Live software. Like the APC40, adding the APC20 transforms the user's experience from one of constructing tracks with a keyboard and mouse to composing and performing with a seamless, fully integrated hardware/software musical system. The APC20 retains many of the APC40's most popular features and capabilities, while shrinking the physical footprint and adding interesting new capabilities. The smaller size enables musicians to perform in less space and makes setting up multiple controllers and devices easier. Power users can use the APC20 in conjunction with an APC40 to expand their track and clip controls. 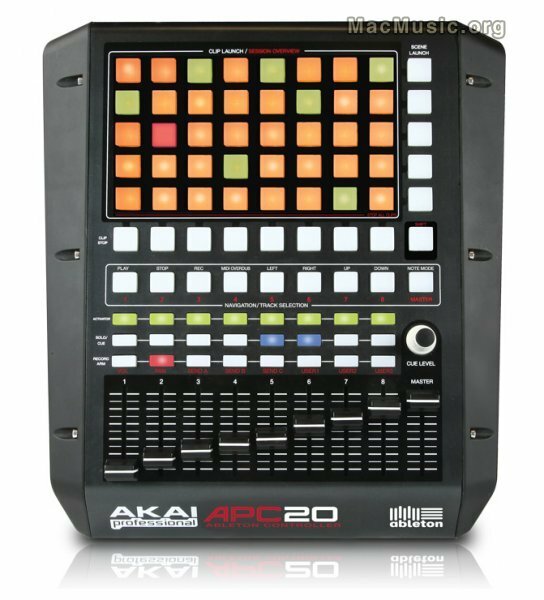 Like the APC40, the APC20 centers on its five-by-eight Clip Launch grid. This bank of multicolor triggers not only start and stop clips playing in Live, they also show cells' status in the software – whether a clip is loaded or not, whether it is playing or not, record-armed status and more. Clip Stop triggers, transport controls and faders round out the control surface. Users can switch the APC20's faders between volume control, pan, sends and three different user-mapped modes. A new Note Mode enables musicians to use the Clip Launch buttons to control virtual instruments and Ableton Live's Drum Rack.